A good friend of mine was in the stands watching his nine-year-old boy playing baseball when he heard his son’s coach yell, “Don’t step in the bucket!” The coach’s comment was directed at a young player who was struggling to hit the ball. Each time the boy swung his bat, he first stepped away from home plate with his front foot. Upon hearing the coach’s instructions, the boy looked back at the coach with a confused expression on his face, and then looked around his feet searching for the “bucket” his coach had referred to. The boy had absolutely no clue what his coach was talking about. Although my friend recognized the disconnect, the boy's coach unfortunately did not. A player’s age, experience, talent level, and personality, determines the content of your instruction and the way in which you communicate information to the player. You need to evaluate your players' level of understanding, and adapt your instructional language accordingly. For some kids, typically beginners, you may need to further simplify your instruction. In the example above, the coach should have recognized that his player did not yet understand the idioms (i.e., sayings) that are commonly used among more experienced baseball players and coaches. In this instance, the coach should have instructed the player to “step toward the pitcher” when swinging at a pitch. One of the responsibilities of a youth coach is to not only instruct players on technique, but also introduce them to the culture and language of the sport. 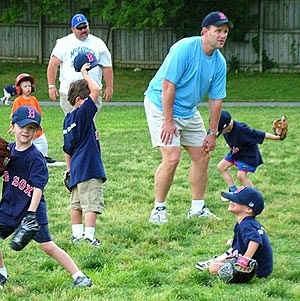 Whenever you use sports jargon during a practice that younger players may be hearing for the first time, elaborate on its meaning and demonstrate the associated technique. For example, when I instruct my players on how to rebound a basketball, I first describe and demonstrate the technique of “boxing out.” I then have each player walk through the various elements of the technique (pivoting, placing your body against your opponent, moving as necessary to keep between your opponent and the basket, and then releasing to go after the ball). Finally, we perform a live drill, where groups of two players put this technique to practice. After going through this process, everyone on the team has a clear understanding of what “boxing out” means and I can use this phrase as needed to quickly communicate with my players. As mentioned above, simplify skill techniques for beginners. Concentrate your instruction on the skill's most important fundamental aspects. Always provide specific advice and instructions. Use the sandwich/Oreo cookie technique to address problems (what was done right – the problem – best action). For absolute beginners, struggling younger players, and children with more sensitive personalities, soften the criticism and emphasize the positive. Older, more experienced players, on the other hand, respond well to constructive criticism—especially when they understand that you appreciate their talent and have higher expectations for them. Whenever you instruct a player, you should always try to match both the content of your instruction and your communication style to the needs of the individual player. Don’t assume that your younger players and beginners understand the jargon common to your sport. You might want to run your team like the pros do it, but youth sports should really be about teaching the basics. It's hard to get your players to understand a complex play when they don't have the fundamentals in place? Remember that you're there to TEACH those kids and that means teaching to their level.